SAM7k.. with a threaded barrel! Yeah, it’s a 24x1.5 RH Bulgarian Arsenal 4 piece flash hider. Bought it from Dissident Arms. I actually got it off today, and nothing looked off. Tried to get it back on, and now it’s stuck in about the same place it was before. here is a picture of the read end with the rail removed. I was hoping for a round hole but it is square notch. not the best picture but you get the idea. maybe someone will come out with an mount that will accept a pignose AR mount. Or is someone comes out with a better brace than the SIG brace. Damn man . Call arsenal TODAY and tell them you had it for less than a week and they need to pay shipping both ways . Because for the price you paid it should be close too perfect . That’s a QC fail right their . They can blame Bulgaria but they should be checking those threads ! Quit messing with it before they decide to void your warranty. Just called and left a voicemail. When I get home tonight I’ll see if I have the strength to twist it back off. Got 2 pistols and 2 beer can boosters direct from KVAR. Having the same issue as piso. The thread protectors that came with them go on with no effort and screw ALL the way down. WTF? On one had I’m sorry you’re having this issue... on the other, I’m glad to hear I’m not the only one. Please keep us updated. E-mailed and PM'd Cliff this morning. Cliff is a nice dude . Last edited by wolf762; 04-13-2019 at 02:14 PM. Good idea, I will do do as well. I already left a voicemail and an email with Arsenal, and spoke to a guy on the phone at K-Var who suggested oiling the threads, which I can’t do since the flash hider is now stuck on again. Mr Bushido is having the same issue ! Last edited by wolf762; 04-13-2019 at 06:25 PM. Last edited by wolf762; 04-13-2019 at 06:58 PM. For what it’s worth, I had Dallas Moore (whatever happened to him?) install a new front end that I got from KVAR on mine several years ago. My Bulgy 4 piece would only screw on part of the way. The threads on the gun looked perfect so I suspected the threads on the flash hider were screwed up. Got a tap on EBay for something like $10 and, after chasing the threads, screwed on perfectly. Some of you are saying that the thread protector screws on easily so my bet is the flash suppressor/booster threads need chasing. just an fyi. i had no issues with installing the kerbs flash hider on mine. I agree, it's a possibility that the Bulgarian 4 piece FH may have bad threads. I have both the CNCW and Ak-Builder 4 piece FH with no issues. Both would screw in smoothly till it makes contact with the FS/GB combo. From what you guys are saying, I agree that it might be an issue with the threads on the flash hider itself, but since it’s now stuck on I don’t want to mess with it. Cliff got back to me and said that he will work with Arsenal to get me a shipping label to send the pistol back. I’m glad he’s taking care of me - can’t wait until this is fixed and I get to shoot it! Same here...sending both pistols and boosters back. I agree with Island and Magician that its probably the booster threads. Especially after Frank and Island report after market muzzle devices going on as designed. Are you sending it back with the 4pc flash hider. If not I can rethread the flash hider. I thought you had the F-H off again. Hey make sure they refinish it too. The SAM7K is supposed to have a quality finish. I have the non threaded one and it's finish is tops. I had it off once and then tried to screw it back on. Now it’s back where it was before, but I’m not able to twist it off. I was surprised about the finish as well. It’s not awful, but compared to my other 2 SAM7s (a non-threaded SAM7K and a SAM7SF) it is in noticeably worse condition. Good job Kvar-Cliff for taking care of them and not pushing them over too the next buildings CS . Cliff/KVAR has been very quick and responsive to this/my issue. Its being handled in a most expeditious way. I also purchased a Kvar four piece, it threaded on like butter. 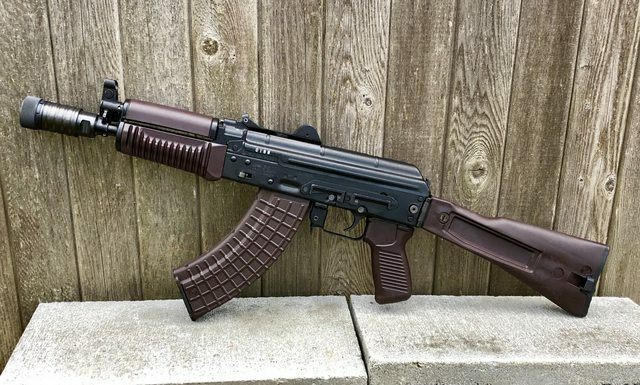 Ran a couple mags through it, it is now my favorite AK. Will put some pics up when I get my adapter next week. Bought a sig folder going to stick a SB tactical brace I took off an AR I have. Until someone comes up with something better going to run with that. Just talked to Arsenal CS. They said their system is down today, but I should have an RMA for both the gun and the flash hider tomorrow. My plan was to pull rail and use a stormwerkz folding adapter through the hole that's already there. the jamc's is actually the Sig adapter, just got mine in. you have to install it did center and you can install it so it folds to the right. Waiting a week now so hopefully PSA will ship the SBA3 that i ordered. I think A message to cliff is in order if not received by Tuesday night . Why doesn’t he manage both businesses CS ?